Posted on 20, May 2016 by EuropaWire PR Editors | This entry was posted in Awards, Education, Healthcare, United Kingdom and tagged ESTRO, European Society for Radiotherapy and Oncology, lifetime achievement award, Professor Michael Brada, University of Liverpool. Bookmark the permalink. LIVERPOOL, 20-May-2016 — /EuropaWire/ — Professor Michael Brada from the University’s Institute of Translational Medicine has been given a prestigious life time achievement award by the European Society for Radiotherapy and Oncology (ESTRO). 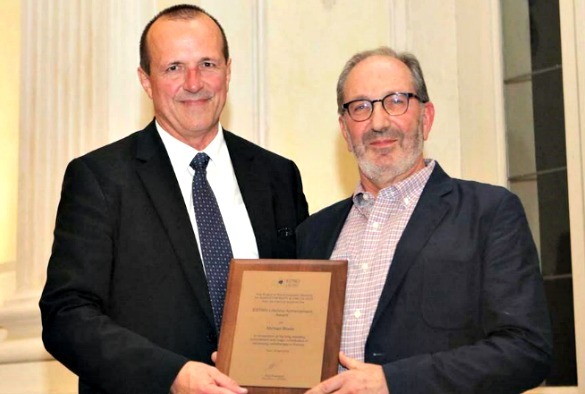 The award, which was presented at the 35th annual meeting in Turin, Italy, is given to those who have dedicated their professional life to Radiation Oncology and the work of ESTRO. Michael Brada is a Professor of Radiation Oncology at the University of Liverpool andClatterbridge Cancer Centre and is a leading expert in neuro-oncology and thoracic oncology. Of his award Professor Brada, said: “I am delighted to have received this Lifetime Achievement Award, which will be a permanent reminder of the great success of Liverpool in leading the way in radiation oncology. Professor Brada was the President of ESTRO (2003-2005) and President of EANO (European Association of Neuro-oncology) nurtured a young organisation towards the principal European force it is now. He has been a leader in the development of radiotherapy in neuro-oncology, with benchmark studies of technical aspects and clinical outcome of stereotactic radiotherapy and key studies of late toxicity of cranial irradiation. He has also made a major contribution to chemotherapy and radiotherapy in glial tumours and brain metastases. In lung cancer he developed and tested novel technologies including motion management techniques and high precision irradiation. Throughout his career has been a passionate believer in evidence based medicine. Professor Brada’s studies have resulted in widespread changes to clinical practice. His interest in evaluation of novel technologies through systematic reviews and meta-analyses focusing on benefit to patients have generated heated debates and continue to irritate “believers” in technical innovation as a sufficient goal for the future of radiotherapy.